Can patient safety improvement still learn from the aviation industry? 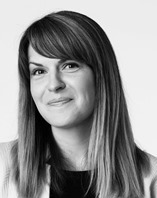 As a clinical psychologist by background, starting out in patient safety research was a learning curve for me. Suddenly the outcomes being discussed weren’t mental health symptoms, they were avoidable patient deaths, medication errors and patient falls on wards. Another thing I began to hear about was the aviation industry. Practices from aviation had inspired early patient safety researchers and I came to understand that we had learned much from them. For example, they had introduced standardised reporting and embraced psychological approaches in order to understand the group behaviours that contribute to safety failures (Helmreich, 2000). More recently, however, this idea has fallen from popularity. When Jeremy Hunt attended a hospital Q&A earlier this week, he used this analogy. 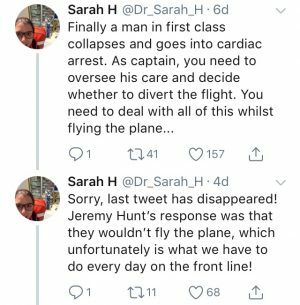 @Dr_Sarah_H, an emergency doctor at the hospital, challenged him on it. 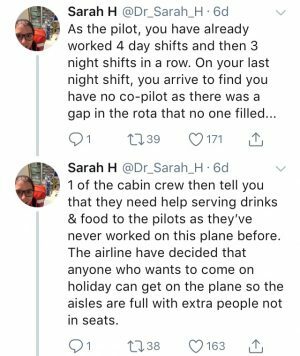 She later tweeted the problems with this comparison, highlighting the relative complexity of healthcare to aviation, the lack of control staff often have over their workload and issues with understaffing in hospitals. Her string of tweets went viral (below). Have both open and confidential reporting processes in place which are simple to use; with confidential reporting, should someone have a concern they feel they can’t raise through normal reporting channels, they can submit a confidential report which by-passes all channels and goes direct to the RAF’s Safety Centre where it will be investigated by an independent team whilst respecting the confidentiality of the reporter. Reporting is viewed as the life-blood of the Safety Management System so some stations have introduced a monthly award scheme for the best report which is awarded by the senior officer on the station.This is aimed at those who report a ‘near miss’, even if it is due to their own honest mistake. Every report is logged and investigated, with feedback provided to the reporter. Everyone receives Human Factors training during which real-life case studies are used to draw out the key learning points. To avoid ‘witch hunts’ which damage the reporting culture, all investigations take place under a strict ‘just’ culture by an independent team. Incidents are rarely found to have occurred due to a single factor; almost invariably a host of contributing factors are identified. In summary, the aviation industry enables their staff to report in utter confidence and rewards staff for good reporting. I think it would be hard to deny that healthcare still has a long way to go to meet these standards. 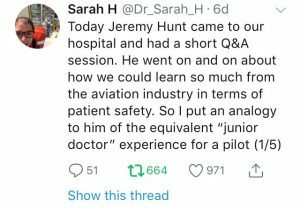 Perhaps the contention then, is not Jeremy Hunt’s point but his target audience: does he expect NHS emergency nurses and doctors to implement these changes? Unlikely. Telling staff working in underfunded services to achieve the safety levels seen in aviation will only engender frustration, the sense that they are not understood and that the impossible is being asked. As with the RAF, these changes will require leadership support, resource and buy-in from the highest levels. A previous post looked at the negative impact of staff burnout on patient care. But how can we tackle this problem? In this post I will consider the evidence for the effectiveness of interventions for reducing burnout. Interventions to tackle burnout are often broadly split into those which are targeted at the ‘individual-level’ and those which are targeted at the ‘organization-level’. Individual-level interventions are context independent; they view employees as people who are suffering from poor mental wellbeing and aim to treat this. They may include stress management workshops, one-to-one cognitive therapy or the provision of support phonelines for staff. Organization-level interventions on the other hand are ‘context dependent’; they view employees as workers being impacted by difficult work circumstances. They may include the changing of shift-patterns or rostering practices, improving canteen facilities or the provision of job training. Are organization-level or individual-level interventions most effective? There is debate as to which type of intervention is most effective. Three recent meta-analyses have found somewhat conflicting results. In a meta-analysis of 15 randomised trials and 37 cohort studies in doctors, West et al. (2016) found that while organization-level interventions were more effective than individual-level interventions for overall reducing overall burnout, there was no difference when the outcome was either of the specific facets of burnout (emotional exhaustion and depersonalisation). In a meta-analysis of 20 randomised controlled trials in doctors, Panagioti et al. (2017) found that organization-level interventions were significantly more effective than those which were targeted at the individual-level. In a meta-analysis in mental healthcare professionals, Dreison et al. (2018) found that individual-level interventions were more effective than those targeted at the organization-level. These conflicting results could partly be due to different interpretations of what the categories of ‘individual-level’ and ‘organization-level’ interventions include. For example, whereas West et al. (2016) included communication training interventions in with individual-level interventions, Dreison et al. (2018) regarded these as training interventions, which they included in with organization-level interventions. The lack of clear findings could also be an artefact of how broad these categories are; when Dreison et al. (2018) broke down the category of organization-level interventions into training interventions and non-training interventions, their results differed again; training interventions were actually more effective for reducing overall burnout scores than individual-level interventions. It is possible that the categories of ‘organization-level’ and ‘individual-level’ interventions are so broad as to be useless. Despite the confusion over organization-level vs. individual-level interventions, the clear message is that overall, interventions ARE effective. DO SOMETHING and there is a good chance your staff will benefit. A first step in developing any effective burnout intervention should be to look at the causes of why this burnout has developed in the first place. This may sound obvious but it is often overlooked. Studies into the causes of burnout have identified several contributors which interventions could seek to address, including poor staffing ratios on wards, lack of time for patient-facing work, inadequate IT facilities and lack of training or professional development opportunities. The unifying theme here is that we need to help staff to love their work – we need to help make the difficult aspects of their work more manageable and support them to maximise and capitalise on the parts of the job they love. A recent example of this is the introduction of a caseload-carrying model of care to midwifery in Australia. Caseload-carrying midwives follow the same women up throughout their pregnancy, rather than simply attending to women who arrive at a clinic when they are working (who will likely have their other appointments with different midwives). There were concerns that carrying responsibility for a caseload may increase the burnout levels of midwives, but in fact the opposite has been found. A study by Dawson et al. (2018) found lower rates of burnout and more positive work attitudes in caseload-carrying midwives than those working in the traditional model. If we consider the causes of burnout, we could hypothesise that caseload-carrying midwives enjoyed stronger relationships with the patients that they had and were able to employ and develop a greater skill-set due to working with women at all different stages of pregnancy. I work in healthcare. What can I do to help myself? Help yourself get good sleep. A recent study suggests that people who get better sleep are less likely to report burnout three years later (Elfering et al., 2018). If you work night shifts, getting good sleep may be particularly difficult for you. The BMA have recently published tips for managing these. Amongst other things, they suggest taking naps of 10-20 minutes during the early part of night shifts, avoiding caffeine and nicotine in the final few hours of night shifts, and wearing sunglasses on your journey home in the morning, even on a cloudy day. Put in boundaries. Nurses who have clear boundaries between their work and home lives have higher wellbeing (Oates, 2018) and psychotherapists who put in boundaries on an emotional level between themselves and their clients (Simionato et al., 2018) have lower burnout. Spend time relaxing, listening to music and being out in nature. Nurses who do this report higher wellbeing (Oates, 2018). Look into training opportunities you can access via work. The budgets for Continuing Professional Development have been squeezed in recent years, but research suggests that healthcare staff who get more workplace learning have higher job satisfaction (Iliopoulous et al., 2018), and training could be one of the best ways to tackle burnout (Dreison et al., 2018). See if there is a way you can get more time to do aspects of the job you think are important. Carefully consider the parts of your work that give you the greatest sense of satisfaction. Is it building positive relationships with patients? Is it contributing to service level improvements? Is it learning about recent advances in your area and seeking to apply this knowledge to your own patients? Whatever it is, see where there could be scope to spend more time on this. Research suggests that doctors believe having adequate time for key tasks is the most important thing to reduce burnout risk (Fortenberry et al., 2018). This blog was written in conjunction with a talk given at the Practitioner Wellbeing Conference in Manchester on 14 June 2018. To download a copy of the slides, click here. What is the link between staff burnout and patient care? Between January 2005 and March 2009, hundreds of patients died due to poor care at Stafford Hospitala. The public enquiry into what had happened at the hospital was launched in November 2010. I was living in nearby Birmingham at the time, and stories of the horrors that had occurred at the hospital were frequently broadcast on the local news. Surgical equipment such as clips and clamps which should have been single-use were being used multiple times; patients on wards were left without water and some became so desperate they drank from vases containing flowers. Food was taken to vulnerable patients but not fed to them, and patients could be heard crying out from their beds due to lack of pain relief. As an NHS employee in a neighbouring healthcare trust, I found it hard to fathom how this could have happened. The Francis Report, the final report from the inquiry into Stafford Hospital, was published in February 2013. It suggested the causes were complex. There were significant staff shortages caused by the cutting of jobs in an attempt to meet a £10m budget deficit. When concerns were raised by staff or visitors through relevant forums, these were ignored. Importantly, staff became disengaged at all levels, and this in itself became a hard-to-measure but important cause of suffering. In one tv news report a former patient, Nicola Monti, describes how she returned to hospital with a bowel condition following the birth of her second baby. She became sicker in the squalid hospital conditions and contracted MRSA. As she speaks about how the nurse communicated this information to her, by throwing the test results down on the bed, tears spring to her eyes. The results meant continued isolation from her two children and intense feelings of loneliness, but it is clear that simply the callous manner in which the nurse told her was in itself a significant cause of pain. Staff disengagement had a key role in contributing to the terrible events that occurred in Stafford Hospital. Thankfully the Staffordshire hospital failings are an outlier, but in my experience these patterns can play out in more muted ways. In a service I worked in where bullying was rife and staff were miserable, patient care did not receive the enthusiasm and energy it should have. On the other hand, in services I’ve worked in where staff felt they were part of a functioning and effective team, the mood was more positive and patients received the best that service had to offer. While I had seen these patterns in services I worked in, I wanted to find evidence to back up my anecdote. I arrived in my current job as a Lecturer at the University of Leeds and Bradford Institute for Health Research in October 2013 with this as my focus. The first thing I discovered when I began my reading in this area is that the workforce is the greatest asset of the NHS. The NHS is the world’s 5th biggest employer, employing 1.7m staff altogether, including 141,000 doctors and 329,000 nurses, midwives and health visitors. The annual bill for employing clinical staff is £43 billion, which is around half of NHS Trusts’ budgets (National Audit Office, 2016). The second thing I discovered is the extent to which turnover and sickness absence –clear outcomes of elevated burnout and disengagement – are causing major problems for the NHS. Between 2011 and 2015 the number of staff leaving their jobs each year due to poor work-life balance doubled. Each time a staff member leaves, costs are incurred due to 1) employing temporary staff to fill their role until a replacement is found, 2) advertising, interviewing and recruiting a replacement staff member and 3) training the new staff member. I was unable to find cost estimates for the NHS, but the price of replacing a nurse has been estimated to be $20, 561 in the USA, $26, 652 in Canada, $23, 711 in New Zealand and $48, 790 in Australia (Duffield et al., 2014). NHS staff are off work due to sickness for twice the number of days as those working in the private sector. What is particularly concerning is that a significant proportion of these days are due to stress and anxiety. In doctors in acute trusts, 17% of all sickness absence days are in this category; in doctors in mental health trusts it is 26% (see my previous blog for more information on this). These absences can lead to delays and interruptions in care and divert NHS resources to paying for expensive agency cover. This problem is increasing: in 2010, £2.2 billion was spent on agency staff, but by 2015 the figure had risen to £3.3 billion. This leads to a vicious cycle: money that could be spent on enhancing services and supporting existing staff is diverted to agency fees. In turn, services suffer, staff are not as well supported and more leave and become unwell due to stress. This further increases the agency bill, and so on. A large body of evidence shows that higher staff burnout is linked with poorer quality patient care. For example, in a study of emergency doctors published in 2015, those who were classed as suffering from burnout said they more frequently ordered extra tests, failed to treat pain in a timely manner, discharged patients to make the department manageable, did not discuss treatment options or answer patients’ questions, did not communicate important information in handovers and did not discuss treatment plans with appropriate staff (Lu et al., 2015). This poorer care is reflected in lower patient satisfaction. In an analysis of the NHS staff surveys of 2009, 2010 and 2010 together with trust-level measures, patient satisfaction was higher when fewer staff worked extra hours, more staff felt valued by their colleagues, staff reported lower work pressure and higher levels of engagement (Powell et al., 2014). While there was a lot of research studies on the link between staff engagement, burnout and quality of care indicators, there was much less research on the link with patient safety outcomes. Exploring this was of key importance to me: in Stafford Hospital, patients weren’t just reporting low satisfaction, hundreds had died. Understanding and evidencing the link between staff engagement/burnout and patient safety was paramount to preventing this from happening again. When I told clinical colleagues of my plans, they told me not to bother: “It’s so obvious, of course staff wellbeing and patient safety are linked. You don’t need to research it”. I became slightly concerned I could be wasting my time, but decided to plough on anyway in the hope that like me, someone else might feel the need to evidence the obvious. First we undertook the first systematic review of studies linking healthcare staff burnout and wellbeing with patient safety. Forty-six relevant studies were identified. The review found that 89% of the studies which measured wellbeing reported a significant association between wellbeing and patient safety, and 83% that measured burnout reported a significant association between burnout and patient safety. The review was led by Dr Louise Hall and published in PLOS One in 2016, and has since received over 100 citations according to Google Scholar metrics, making me glad that I didn’t heed the initial discouragement I received! Which matters most – general mental wellbeing or burnout in particular? The concept of more general mental wellbeing (e.g., depression) is distinct from burnout, which focuses specifically on negative work experiences and attitudes. I became interested in which of these areas may be most important to focus on in relation to patient safety. To address this we conducted a survey study in 323 nurses across 3 trusts. Participants completed measures of burnout, depression and perceptions of patient safety. Statistically speaking, we found that while both burnout and depression had direct individual associations with patient safety perceptions, the association between depression and patient safety was fully mediated by burnout. In other words, we found that depression IS linked with patient safety, but it is the portion of depression that overlaps with burnout that creates this link (See Figure 1). In short, burnout seems to be the more important concept to focus on. We concluded that interventions looking to improve patient safety may benefit from focusing on burnout in particular, for example using strategies to enhance staff engagement in work rather rolling out one-to-one therapy for depression. The study was published in Journal of Advanced Nursing. Figure 1. It is the portion of depression that overlaps with burnout that is linked with poorer patient safety perceptions. A final question we wanted to answer was into the mechanisms of this association: if a staff member is feeling burnt-out, how does this turn into poorer patient care? We addressed this in a qualitative study led by Dr Louise Hall, which was published in the Journal of Patient Safety. Five focus groups with 25 GPs were undertaken. GPs thought poor wellbeing and burnout affects care quality by reducing doctors’ ability to empathize, increasing their negative attitudes to patients and by increasing the likelihood that the GP will simply refer the patient on rather than manage them in clinic, even if the referral isn’t really appropriate. GPs thought that burnout impacts patient safety by reducing their mental functioning and decision making abilities and increasing their fatigue. As one GP said, when burnt-out, they may be less likely to ‘connect dots’ across time and realise that current symptoms may be indicative of a bigger picture indicating a more concerning problem; because of this they could risk missing an important diagnosis. Interested in how healthcare staff burnout can be tackled? Please see this blog post. This blog was written in conjunction with a talk given at the Practitioner Wellbeing Conference in Manchester on 14th June 2018. To download a copy of the slides, click here. a The Francis report of February 2013 concluded that it would be unsafe to infer from these statistics that there was any particular number of avoidable or unnecessary deaths at the trust. It was an article that started life as a conversation. We sat around a table in March 2016, discussing mental healthcare staff wellbeing. Someone pointed out the increase in burnout they had seen in mental health staff in the services they worked with; someone else spoke about the unique demands of working in mental health care settings, and how staff burnout may impact patient care. It felt like we were tapping important issues; etching out a line of argument we had not seen articulated in any academic articles we had read. Then I heard myself pipe up, “This feels like a paper. We should write a paper. I’ll draft it”. Famous last words. As I left the room my enthusiasm waned a little. Had I really just volunteered to write another review? I knew I was going to need to access original data from government sources to build the case, which was new for me. I scoured NHS Digital and other sites, entering the numbers into excel files in order to plot graphs. These told me that the proportion of NHS staff feeling unwell due to work-related stress had risen by 9% in 8 years (from 28% in 2008 to 37% in 2016; Figure 1a), and double the number of NHS staff had said they were leaving because of poor work– life balance in 2015 compared with 2011 (Figure 1b). I was stunned. Figure 1. Percentage of staff reporting having felt unwell due to work-related stress on the NHS staff survey. (Source: NHS staff survey data; www.nhsstaffsurveys.com) (A) and number of staff citing poor work-life balance as their reason for leaving their NHS post. 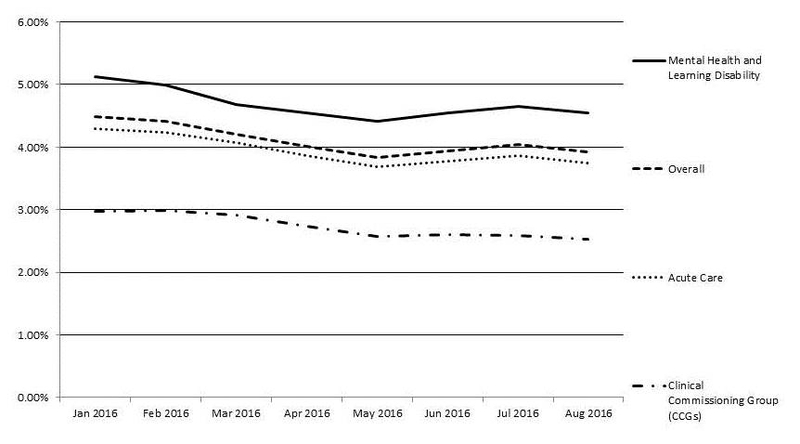 (Source: NHS Digital; https://data.gov.uk/dataset/nhs-workforce-reasons-for-leaving) (B). Are these problems just in the UK? The NHS has suffered significant underfunding for several years (Kingsfund, 2017) which has been a cause of staff stress, so I wanted to check whether these problems may be NHS-specific or similar in other countries. I found relevant data provided by the US Bureau of Labour Statistics (2017). Given the vast differences between the organisation of UK and USA healthcare provision it was an interesting point of comparison. This data suggested workers in healthcare support occupations take the most sickness absence of all employees, with rates 50% higher than private sector employees. It was clear that these patterns were not UK specific. Are they any differences between staff working in mental healthcare and other settings? Curious to compare mental healthcare staff with healthcare staff in other settings, I emailed NHS Digital to get a breakdown of sickness absence rates by trust type. These told me that mental healthcare staff are off work due to sickness on more days than the overall average for healthcare staff, and on more days than those in both acute trusts and primary care (Figure 2). Mental healthcare staff also more frequently cited anxiety, stress, depression and other mental health problems as the reason for this absence. Figure 2. Sickness absence rate by trust type. (Source: NHS Digital: http://www.content.digital.nhs.uk/catalogue/PUB22562). It occurred to me that the proportion of different types of staff varies across trust type. Some trusts employ relatively more doctors, and others relatively more allied health staff (such as occupational therapists and physiotherapists). What if this variation in staff type explained the variation in sickness absence? To test this, I restricted the analysis to first doctors, then nurses. It didn’t make a difference. In doctors in acute trusts, 17% of absences were in this category, compared with 26% in doctors working in mental health. In nurses in acute trusts, 18% were in this category, compared with 25% in mental health nurses (NHS Digital, 2017). It was quickly becoming apparent that the concerns we had raised in our conversation and the observations of members of the authorship team were backed up by hard data. In order to consider the impact these high rates of stress may have on patient care, my co-authors and I reached into our knowledge of the general healthcare literature. A previous systematic review we had completed (Hall et al., 2016) found that high staff burnout is linked with greater risk of medical errors happening (or poorer patient safety) across healthcare settings. Medical errors can include being prescribed the wrong amount of a medication by your family doctor, being administered a medication you are allergic to by your nurse in hospital, or even being operated on the wrong body part by your surgeon. As expected, when we searched for studies investigating this area in mental healthcare staff a similar pattern emerged. For example, Brady et al. (2012) found that running a mindfulness-based-stress-reduction intervention with mental health staff improved patient satisfaction scores and decreased rates of patient safety events during the 3 months after the intervention. However, there was a disappointingly small amount of research linking healthcare staff wellbeing and burnout with patient care in mental health, and more is needed. There were also fewer studies looking at burnout and wellbeing interventions in mental healthcare staff than other staff groups, but I was pleased to find a recent systematic review and meta-analysis by Kimberley Dreison and her colleagues (2018) focused specifically on burnout interventions in mental healthcare staff. This review identified 27 studies. Interventions included stress management workshops, clinical supervision, and staff training. Overall, interventions were effective but only led to small improvements. What type of interventions are most effective? Interestingly, when interventions that focused on individual staff members (e.g., psychological therapy) were compared with those that focused on organisational changes (e.g., introducing staff support groups), individual-focused interventions were more effective. However, when staff training and education interventions were separated out from other types of organisational interventions, they led to greater improvements than individually focused interventions for overall burnout scores. This suggests that training and education interventions may be the best place for future research into burnout reduction in mental healthcare staff to focus on. It also suggests that simple comparisons between individually-focused and organisationally focused interventions could be misleading. Ground interventions in the research literature: When developing burnout interventions, first understand what the causes of burnout are. Design your intervention to address this. Overall, the research literature suggests that poor staffing ratios, the emotional demands of caring for complex patients, lack of leadership and lack of training are all burnout contributors. Furthermore, draw on what the research tells us is likely to be effective. The best evidence at present suggests that staff training interventions may be particularly effective for reducing overall burnout. Increase the value of interventions: We know that staff burnout is consistently linked with quality and safety of patient care. It is also likely that these two operate in a feedback loop; not being able to provide high quality care is probably detrimental to staff burnout. Developing interventions which simultaneously reduce staff burnout and enhance care quality may meet two needs at once and be self-reinforcing. Again, staff training interventions would tick this box. Build bridges between universities and healthcare organisations: Partnerships between universities and healthcare organisations can help identify new and relevant topics for research, ensure studies meet current service and patient needs and help results to have a greater impact in the real world. Engage healthcare staff by emphasising the positives: There is a perceived stigma linked with admitting poor mental wellbeing in healthcare staff. Staff may fear that disclosure could cause career damage or put their professional registration at risk. As such, rather than offering burnout interventions as a fix for those who are struggling, emphasise the additional benefits that participants may reap. These include increased job satisfaction, life satisfaction, relaxation, and improved physical health. Be clear that interventions are not for the suffering but those who want to thrive in their work. The article is published in the International Journal of Mental Health Nursing. To read the paper, follow this link. Brady, S., O’Connor, N., Burgermeister, D. & Hanson, P. (2012). The impact of mindfulness meditation in promoting a culture of safety on an acute psychiatric unit. Perspectives in Psychiatric Care, 48, 129–137. Dreison, K. C., Luther, L., Bonfils, K. A., Sliter, M. T., McGrew, J. H., & Salyers, M. P. (2018). Job burnout in mental health providers: A meta-analysis of 35 years of intervention research. Journal of Occupational Health Psychology, 23(1), 18-30. Hall, L. H., Johnson, J., Watt, I., Tsipa, A. & O’Connor, D. B. (2016). Healthcare staff wellbeing, burnout, and patient safety: A systematic review. PLoS ONE, 11, e0159015. NHS Digital (2017). Sickness Absence Full Time Equivalent Days Lost by Staff Group, Organisational Type and Reason for Absence. Dataset provided by the Health and Social Care Information Centre on request on 24th April 2017. Put yourselves for a moment in the shoes of a sonographer, conducting an ultrasound scan on a pregnant woman. Perhaps her partner is there, and they are excited, smiling, and asking you the gender of their baby. Suddenly you notice an unexpected finding on the baby’s left arm; you can’t see his hand on this side. Perhaps it’s tucked just out of sight, but you can’t be certain. He may be missing his hand. What would you do next? What should you say? In the past this question has been answered too quickly. It has been assumed that the answer can be drawn from either 1) the sonographer’s personal experiences at work or 2) from research into how to ‘break bad news’ in other areas of healthcare, like cancer services. Both these assumptions are seriously flawed. The first assumption is flawed because parents do not initially react based on how well the sonographer communicates this information. Instead, after hearing this news parents go into shock (Mckechnie et al., 2016). This means that the healthcare professional may do a great job of communicating the news and find the parents are extremely upset. On the other hand, they may do a terrible job and find the parents seem quiet and calm. The bottom line is that parents’ reactions at the time of the event are not a good indicator of a healthcare professional’s communication skills. The second assumption is flawed because delivering this news is different to delivering news in any other area of healthcare. In other areas of healthcare, the focus has been on ‘bad news’ (Baile et al., 2000), and this is not bad news, it is simply unexpected news. It also comes without warning; the parents are watching the sonographer’s face as they do the scan, and know as soon as something is out of the ordinary. Guidelines for delivering news in other areas of healthcare are not appropriate to apply in this situation. It won’t come as a surprise then that in a survey we conducted in 2014, parents reported very low satisfaction with their experience of being told their baby had a limb difference (Johnson et al., 2016). To explore this area some more, we recently interviewed 20 parents (nine fathers, 11 mothers) who had had a baby with a limb difference in the UK in the last five years (for the full paper see HERE). Eight of these parents were told the news at an ultrasound scan, but 12 didn’t know about their baby’s limb difference until they were born. We asked these parents about their experiences of being told the news of their baby’s limb difference and how they thought this could have been improved. Parents were keen to take part in the study. They had a range of experiences and while some wanted to participate because they felt things needed to improve, others were grateful for the excellent healthcare they had received at this time. However, all parents felt this was a defining moment in their lives: whether things had been done well or not well mattered. Receiving this news was the start of a journey into the unknown, and good experiences at the start had a lasting influence on how this unfolded. In line with previous studies, all parents were shocked to learn their baby had a limb difference, but parents were less shocked when the limb difference was found on an ultrasound scan and they had time to process this news before their baby was born. They were also less shocked and less anxious when they had a friend or family member with a disability. Information about support organisations: Organisations such as Reach helped parents to find the right information and provided a support network. However, most parents only discovered these organisations through extensive online research and would have preferred to be told about these right away by the healthcare professional who told them the news. Information about limb differences: While most parents wanted as much information as soon as possible about the limb difference, some said they felt overwhelmed and preferred to process the news at a slower pace. All of these parents said that being given written information would have been helpful. Good communication skills: Parents wanted clear but sensitive communication from their care providers. In contrast to research in other healthcare settings, parents preferred it when healthcare professionals described the limb difference in a no-frills way, for example, “I cannot see your baby’s arm below their elbow on the left side”. Parents didn’t like it when healthcare professionals led into this with a warning sentence, like “I have found something wrong” or “there is a problem”. When this was said, it needlessly increased parents’ anxiety. A care plan: Most parents felt frustrated about delays in their child’s health care; they described accessing appropriate care as a ‘battle’ and said they would have liked to know what their plan of care was going to be immediately. Only a few parents felt the plan of care they received had been good enough. Parents don’t like strangers appearing in the scan room: Some parents described being asked to go for a walk and returning to find a second sonographer in the scan room. For one parent, this was enough to trigger floods of tears, as she knew it meant something was wrong. Parents preferred it when they were warned in advance that a second sonographer was going to be invited in, and were given an honest rationale for this (e.g., “I cannot see your baby’s arm, so I need to find someone who is more experienced”). Show that you care: Several parents said that they know delivering difficult news is hard for healthcare professionals and it is challenging to get this ‘right’. However, if they thought the healthcare professional cared, they tended to view them positively and be forgiving in any missteps in wording or communication. Don’t panic: Parents appreciated it when healthcare professionals were confident and professional; when instead healthcare professionals communicated their personal shock at the dysmelia diagnosis (e.g., “this has never happened before”), parents felt more anxious and alone in their situation. Insensitive questions are as bad as insensitive statements: When parents discovered the limb difference at birth, some reported being quickly asked insensitive questions. For example, one parent was being stitched up from her caesarean section when her doctor asked her what drugs/medication she had taken during pregnancy. The implication of questions such as these is that the parent has caused the limb difference by something they have done. Parents who received these types of questions too quickly found they had a strong and lasting negative impact on them. Johnson, J., Adams-Spink, G., Arndt, T., Wijeratne, D., Heyhoe, J., Taylor, P. J. (2016). Providing family-centred care for rare diseases in maternity services: Parent satisfaction and preferences when dysmelia is identified. Women and Birth, 29, e99-e104. The reference for the paper described in this blog is: Johnson J., Johnson, O., Heyhoe, J., Fielder, C., & Dunning, A. (2018). Parent experiences and preferences when dysemlia is identified during the prenatal and perinatal periods: A qualitative study into family nursing care for rare diseases. Journal of Family Nursing. In press. It can be viewed on the journal website HERE.